Confirming what everyone who has taken the subway over the last year has been feeling/complaining about, the MTA announced Monday that ridership on our city's sprawling subway system hit a 65-year high in 2014 with over 1.75 billion -- yes, billion with a 'b' -- customers, or a 2.6% increase over the year before. 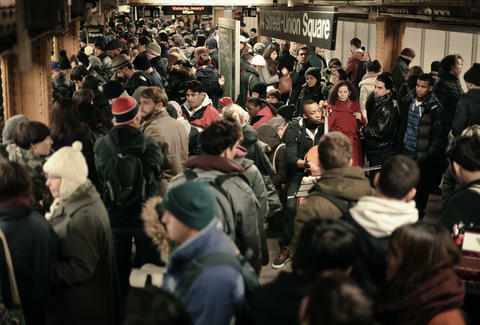 In the last four months of 2014, daily subway ridership surpassed 6 million people on 29 different weekdays, which the MTA said hasn't happened since the period after World War II. For perspective, that 6 million daily MTA ridership is more than double the population of Chicago. Unsurprisingly, the surge in New Yorkers cramming themselves onto the trains has strained the system and has left the MTA grappling with delays, overcrowding, and increased demand even during off-peak hours when MTA crews do maintenance work -- you know, like the L train work every weekend until May 18th. At this point, minor disruptions on the subway lines can lead to "major delays," MTA Chairman and CEO Thomas F. Prendergast said in a statement. The solution is to upgrade the subway's aging infrastructure and install new, improved signaling systems, he said. Across the system, the average daily weekday ridership increased by over 130,000, to 5.6 million, and the average weekend ridership hit 6 million. Subway trains saw increases in riders during every part of the day and all throughout the week, including significant increases off peak hours, or outside of the morning and evening rush periods. Ridership was up on every train line and in every borough, but especially neighborhoods that have seen recent residential development growth like Long Island City and Bushwick. The average weekday ridership increased the most in Brooklyn (by 2.7%) with over 30,000 more riders per weekday, followed by Manhattan (up 2.5%), the Bronx (up 2.1%), and Queens (up 1.9%). Every Brooklyn L train station saw an increase in riders in 2014, with an average of more than 5,600 additional people on weekdays and the largest increases were seen on the line's Bushwick stops. M line ridership was up 6.2% at stations between Marcy and Metropolitan avenues in Brooklyn. In Queens, weekday ridership increased by 12% (about 1,500 riders) at the Vernon-Jackson Av 7 station and 9.7% (about 2,000 riders) at the Court Sq E/G/M/7 station. In the Bronx, the MTA saw a 3.7% increase in ridership on the 2 and 5 lines, adding almost 5,000 more riders per day. And in Manhattan, the 2 and 3 lines running through Harlem also saw a 3.7% increase in ridership. So basically, the subway system was jammed packed with people in 2014, we can guess that numbers for 2015 will likely paint a similar picture, and meanwhile, the MTA's five-year, $32 billion capital plan to finance much-needed repairs and improvements -- like those new signals -- across the system faces a $15 billion budget gap... Awesome. Tony Merevick is Cities News Editor at Thrillist and, luckily, can still get around just fine. Send news tips to tony@thrillist.com and follow him on Twitter @tonymerevick.